We offer full service catering, including onsite grilling! 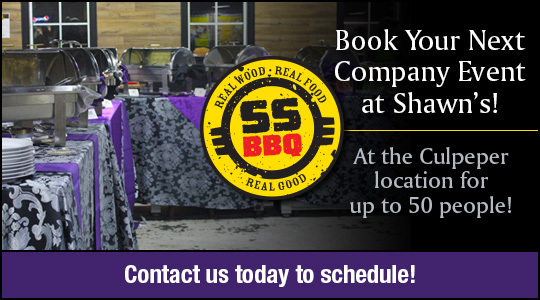 From corporate gatherings to intimate weddings, let Shawn’s Gourmet Catering take care of you. Welcome to Shawn’s Smokehouse BBQ. Home of “Scrunch” and the best BBQ flavor imaginable. We are a local, family-run business in beautiful Culpeper, Virginia. Owner, Shawn Moss has worked to perfect our flavors with his homemade sauces and use of on-site smokers. Winner of several regional BBQ contests, as well as the Culpeper Chamber of Commerce Business of the Year 2013. We welcome you to visit and become part of our growing family. 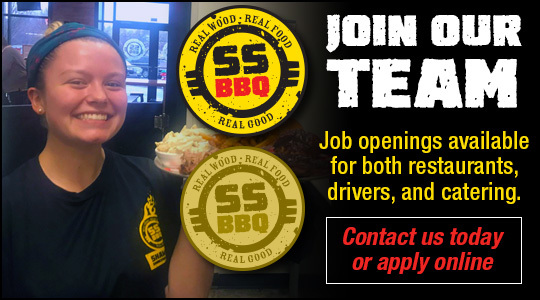 Shawn’s BBQ and Shawn’s Gourmet Catering are looking for friendly and motivated people! We have openings in our restaurants and catering, including drivers. Apply Today! Now offering express catering packs! Please visit our Gourmet Catering page for our full line of extensive catering packages. Perfect for small events, sporting events, business gatherings. Please give us 24 hour notice. Book Shawn’s For Your Next Event! We can host your party up to 50 people at our Culpeper location or we can cater at your location. Check out our Gourmet Catering options. We aren’t just BBQ! Two Great Locations in Culpeper and Warrenton, VA!